Text of Evolution of an Artist: San Francisco Appreciation Society Celebrates Eugene E. White, delivered at Elders Project 2013 Special Reception, African American Arts & Culture Complex, San Francisco, CA, July 11, 2013. I have known of the artist Eugene E. White for decades, but it wasn’t until fairly recently, that I’ve come to know a little more about my fellow San Franciscan as a vital community member, with wisdom and experience to spare, and as a visionary artist. 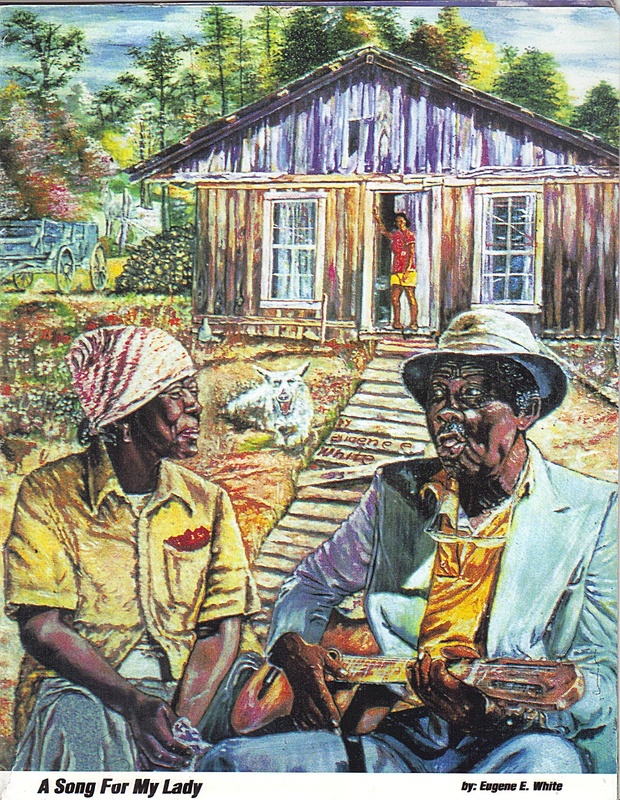 Humble heroes and heroines with rural roots, the people who raised families then sent them away from the South for better lives elsewhere, are the elders Eugene E. White honors in his work. 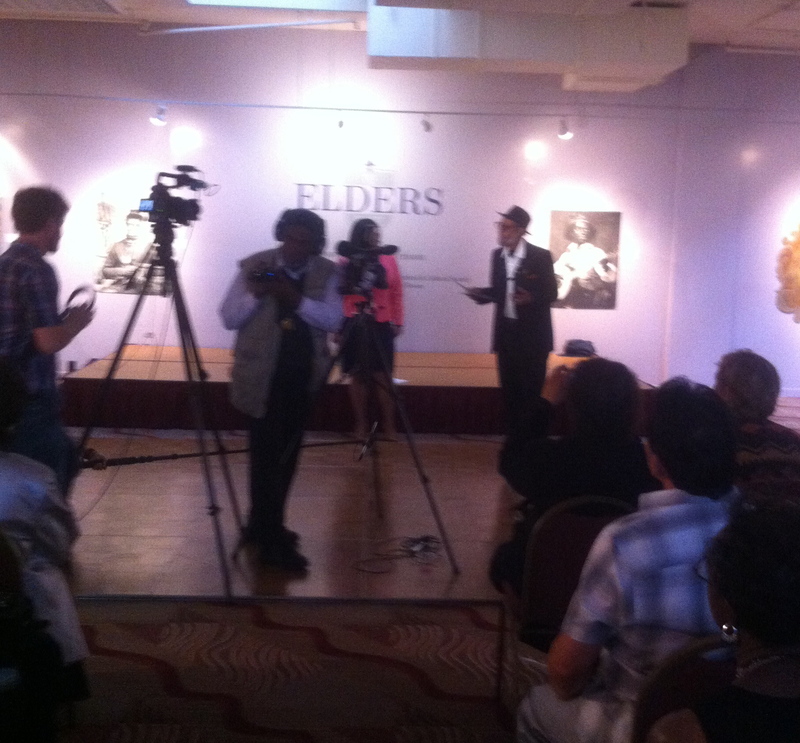 Tonight, we honor the elder as artist. From a boy in the backwoods of Arkansas, to a young man in the Cadillac factory of Detroit, Mr. White came to San Francisco in 1958 and made his way as a sign painter and electronics repairman. 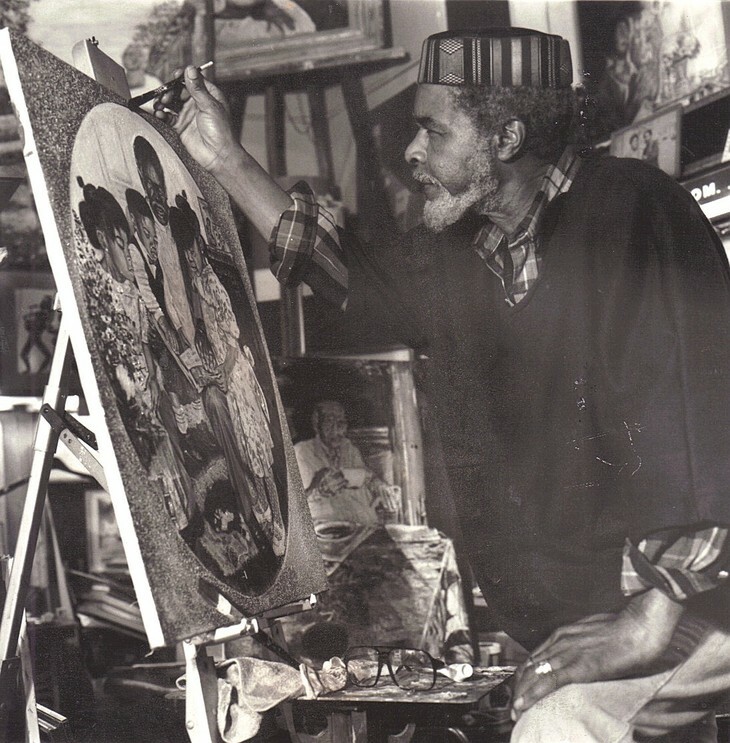 He opened his Kujiona Gallery in 1963 and followed with a show in 1964, sponsored by Bulart in Golden Gate Park’s Hall of Flowers; from that start, fine art became his full time pursuit. Traveling across the country and over seas, seeing all the great changes of the 20th and 21st Centuries, he brought his artist’s insights home with him. Yes, he’s known racism and participated in the fight for equality—and the artwork was part of that, whether at ’60s community meetings in his gallery, at the 1970s original Black Expo in Chicago, or as recently as this year’s Juneteenth festival in the Fillmore. He also paints great figures from the past—Harriet Tubman and Frederick Douglass—and from his lifetime—Rosa Parks, Malcolm X, Dr. King, and President Obama: They are the portraits of progress. But another story runs alongside that narrative: Mr. White has seen his community and neighborhoods devastated and dismantled. Poverty, violence, and prison statistics grow grim, courtroom injustices roll by and voting rights are rolled back, and yet he doesn’t flinch from these facts. He is an artist, and as such he holds a vision that we can change history from here—for the good and for the better—by coming together and writing a different script. That is in part why he agreed to show the paintings, so we could better see the here and now. Mr. White has a calling, not only to paint, but to tell stories through images that help us better see everyday people—ourselves and each other—“the people without titles,” as he describes his subjects. When I came by to see him and his wife Lynnette late last year, it was as a journalist, to inquire about the paintings and the process, to find out what he’d been doing in the years since I first made his acquaintance. Of course he was painting, and had two commissioned portraits in progress, but he wasn’t publicly showing his work outside his own gallery—which is why tonight is a very special occasion. As we take time to admire the canvases and their images of beauty, resilience, and courage, let us also reflect on their maker’s message: Mr. White’s gift is a starting place for a dialogue on life, its sacrifices, and what can be done to improve circumstances, for ourselves and for those around us. His success as an artist is a demonstration of his passion and dedication not only to art, but to the art of life. May this night inspire a young man or young woman in the room to pursue his or her dreams to pick up a brush or a pen and make art in San Francisco, to become our city’s next fine artist for the next 50 years. We appreciate the White Family, for letting us into your lives; and especially Mr. White, who has made an indelible impression on our city: The San Francisco Appreciation Society and those of us assembled here tonight wish to say thank you. Eugene E. White received commendation for his art and service to the City of San Francisco from Supervisor London Breed. Later in the evening, San Francisco Appreciation Society honored him with a Proclamation from Mayor Lee declaring July 11 Eugene E. White Day. I was excited to find this article after having found two signed prints by Eugene E White, that belonged to my father-in-law. I took time to research the artist and was happy to learn of his life and recognition and appreciation for his work as an artist. Thank you. Didn’t realize he had a gallery or where he was from. Spoke of his drawing on Friday pass and decided to google him. Have a drawing I purchased in ’88 in New Orleans of a little boy w/newspaper underarm and one britches leg rolled up. I’ll be doing more research on him and drawings.